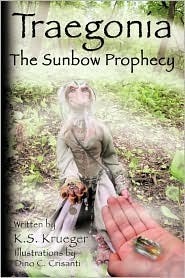 The Sunbow Prophecy is the first in the Traegonia series. The story starts out with a family enjoying the woods. Dino accidently stumbles onto two Trageon younglings, Karia and Juna. Traegons are a secret group of creatures who never reveal themselves to humans. That meeting starts an old prophecy that Dino finds himself right in the middle of. As Karia and Dino work to prevent the forest from being destroyed they become best of friends. K.S. Krueger has created a fascinating tale where fantasy comes into the real world. The Traegons are fun, new creatures that value and respect the world around them. The theme has a strong conservationist theme, but the overall story is good. The storyline is a little predictable for older teens but a middle school student will enjoy it. Hi Melanie, Thanks for the opportunity to have my book reviewed on your blog. I greatly appreciate it.